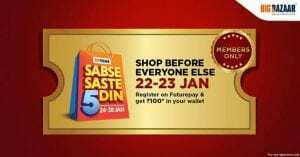 FuturePay is Again back with a New offer, Future Pay is offering Rs.100 Signup Bonus as Wallet Credit on Signup on Futurepay.The Cash is Redeemable at BigBazaar Stores During Big Bazaar’s Offer Sabse Sate 5 Din. The Offer will be Live From 22-23 Jan (24-28 Jan Offer days).You need to Shop Minimum Rs.1000 From Bigbazar to avail Free Wallet Cash. 1.Download FuturePay App From Playstore. 2.Now just Complete The Signup, You need to verify your Mobile Number using OTP. 3.Now just check Your wallet You must be got Rs.100 instantly. 5.Share the Futurepay Mobile No. With Counter Executive and you will receive an OTP. 6.Share The OTP and Complete The Transaction. Redeem or Use this Bonus credits before 23rd January otherwise, they will expire. Offer is only valid for all users who download & register on Future Pay App before the 20th Jan’18.